All that bumping and bruising sure makes an audience thirsty! 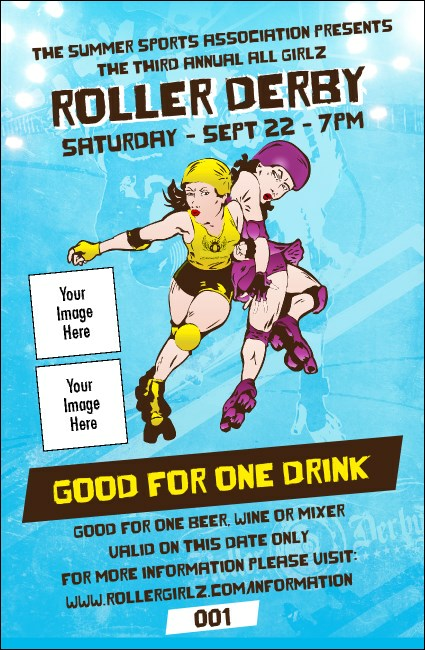 Juke your way to happier fans with Roller Derby Jammer Drink Tickets for your next bout. In a brilliant light blue background with two rough and tumble dames battling for the lead, this ticket has all the right gear. Each ticket comes complete with secure numbering and space to upload two images. Sip your way to success with Drink Tickets from TicketPrinting.com!